With nearly $40,000 awarded to Ultimate players during the 2013 pro league seasons ($14,700 in MLU; $25,000 in AUDL), prize money is becoming commonplace in Ultimate. Gone are the days when players are playing for "nothing," or even "making zero dollars playing Ultimate." 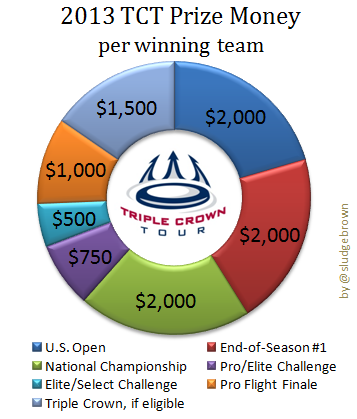 Nearly $30,000 is available for USAU's Triple Crown Tour. Per TCT Guidelines: "Prize money will be awarded in recognition of competitive excellence and in order to help offset some costs for teams that are invested in and committed to the Triple Crown Tour season." The most one team could earn = $9,250. Total TCT prize money = $29,250; TCT guaranteed* prize money = $24,750. *The majority of prize money is awarded to winners of the 5 scheduled tournaments and the end of the regular season #1's. Only teams who win the "Triple Crown" - winning the US Open, the Regular Season, & the National Championships - are eligible for an extra $2000 bonus. 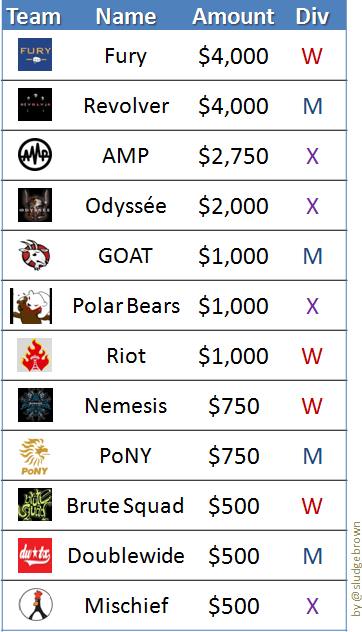 For a 27-player roster, $74.07 is the highest payout an Ultimate player can earn per prize. 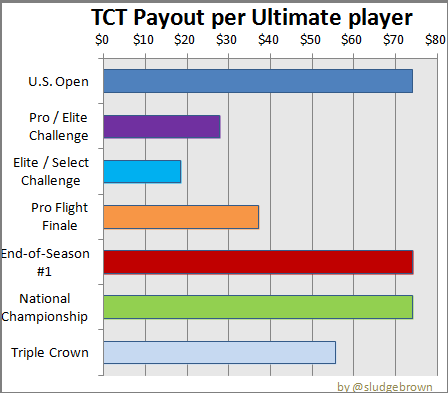 The most an Ultimate player in the TCT could earn = $342.59. 'Earn' is relative. Nobody is making money playing the Triple Crown. People are only having parts of their flights / fees subsidized. The maximum for one player - $342.59 - would basically only cover that person's flight to Frisco. Like the stats, interesting. It would take some digging, but what about a "Cost of Ultimate" post? 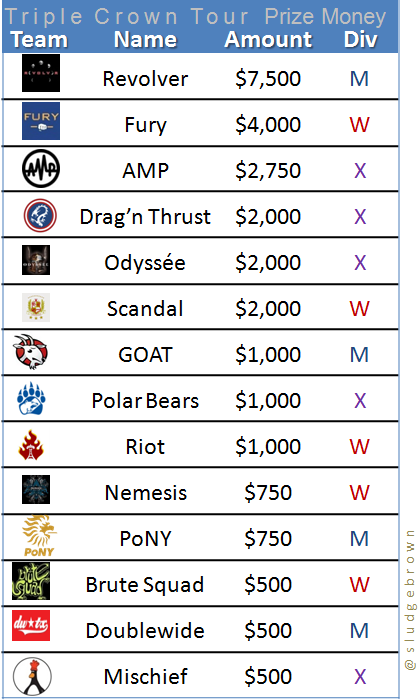 What did Revolver, Fury or AMP spend to get to all of their Triple Crown events? Revolver posted an article in Jan 2013 that estimated ~$1600/player. For Sludge's "budget," view http://sludgeonline.blogspot.com/2013/01/ultimate-team-budget.html. Why do you call the Open division "Men"? Sure, on the highest level only guys play, but it's the wrong term and not even correct by the rules. I think we should all keep gender integration as a high standard (which for example the IOC liked about the WFDF application). The term "Men" versus 'Open' is dictated by USA Ultimate; it a recent change.